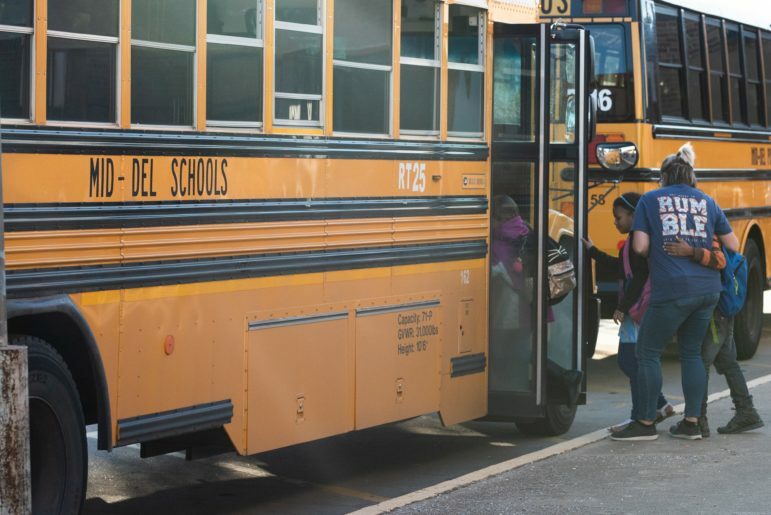 Mid-Del Elementary students load onto buses after school. Mid-Del Elementary and other Oklahoma schools will be graded on revamped A-F report cards. After a two-year hiatus, school report cards are coming back. The school accountability tool underwent a significant revamp and will now include student test scores, a new way of measuring academic growth and measures of chronic absenteeism and college readiness. Most states revised their school accountability systems to comply with the 2015 federal Every Student Succeeds Act (ESSA), which requires certain measurements but also gives states some flexibility. Oklahoma’s new school report cards are expected to be released Dec. 18 at the Board of Education’s December meeting, according to information on the state Education Department website. School report cards are used by families in choosing a school for their children to attend. But they’ve been controversial at times—particularly the letter grade awarded to each school. “If you get an A, it’s very exciting. If you get a D or an F, it’s very demoralizing. If you’re one point away from the next letter grade, it’s very frustrating,” said Rick Cobb, superintendent of the Mid-Del School District. Cobb said while he’s opposed to assigning schools a letter grade, he does think the new, multi-measure system will give a clearer picture of a school. One possible change in the presentation of report cards on the state website: The actual letter grade for schools is deemphasized in the design, at least according to a preliminary mockup the Department of Education is using in an informational video. Instead of the large overall grade and score displayed at the top of previous versions, indicator grades are shown in small circles with the overall grade at the bottom. The old A-F report cards, left, will be replaced by a new design and retooled metrics. The new, preliminary report cards, shown right as a mock-up, could change before the state Department of Education unveils them to parents. Oklahoma is one of 11 states to use a letter grade this year, according to Achieve, an independent nonprofit organization focused on strengthening accountability and raising academic standards. Other states rate schools in different ways, like through a star system or categories like “meets expectations,” for instance. In anticipation of the upcoming release of Oklahoma’s report cards, here’s what we know and why it matters. About 90 schools will receive an F, and 90 will receive an A. The rest will fall in the middle. This is because ESSA requires states to identify and provide extra support and funding to the schools in the bottom 5 percent. The Education Department is distributing this year’s grades on a bell curve so that 5 percent of schools will receive the highest letter grade as well. Test scores in 2018 trended down, and that is likely to be reflected on the report cards. 2018 was the second year under new state tests that aligned with higher academic standards, and there were widespread school closures just before the testing window due to the teacher walkout. There were also nearly 2,000 emergency certified teachers in schools that year, which some educators say may have affected student learning. In every grade (3rd through 8th) and subject (math, English Language Arts and science) tested, the percentage of Oklahoma students proficient in 2018 dropped compared to 2017; the only exception was 7th grade math, which was flat. Students’ scores are counted once based on their “primary student group.” This is somewhat unique to Oklahoma’s system and the priority order has changed since the proposal. Students will now be placed into the first category that applies: students with disabilities, economically disadvantaged, English learner, Black, Hispanic, Native American, Asian/Pacific Islander, two or more races, and White. Achievement goals are based on the subgroup with the underlying belief that all students can grow, which is different than the previous system (under No Child Left Behind) which was to reach proficiency. Growth measures were a large part of the old report cards but the new system calculates growth differently and gives schools credit for incremental improvement. The report cards will look very different than those of the past. The report cards previously emphasized the overall letter grade, which was large and bold at the top. In the new report cards, the letter grade is accessible but not the focus, according to a Department of Education video linked on its website (the video uses a fictional school and data). The top includes basic school information (address, enrollment, principal name) and available programs. Below that users will find how the school fared in several areas: academic achievement, growth, progress of English learners and chronic absenteeism. The report cards’ design has not been finalized.